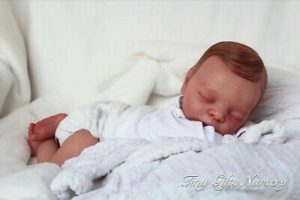 This cute preemie reborn baby boy is currently for sale on ebay. Please bare with me with the photos below, I know there are a few repeats. The html editor was giving me serious problems. Hello! Welcome to baby Micks auction! Here you will find all of his key details. 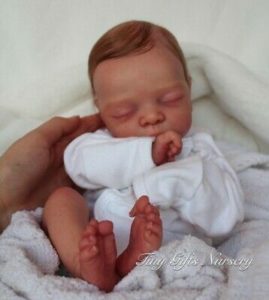 Baby Mick is sculpted by Adrie Stoete. This kit is one of my favorites of hers! It curls up in your arm just perfectly. 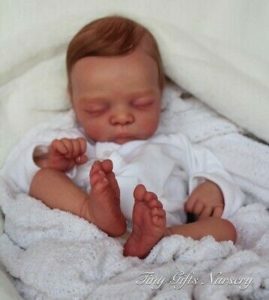 This baby is 17″, and wears size preemie. Although he is very cuddly and weighted like a real baby at about 4.5 lbs. He has a custom cloth body and full moveable limbs. This beautiful baby is painted and varnished with GHSP so it will not come off. 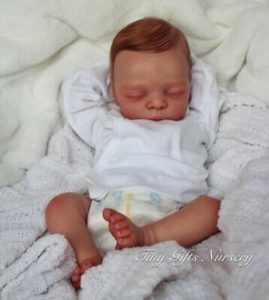 He has micro rooted hair with the softest hair ever! It is directionally rooted and has a swirl if brushed correctly. Mick has a magnet for a pacifier as well. He can arrive home a little girl if preferred. All of my dolls come packaged very nicely with a custom shipping box and lots of goodies including all original paperwork. Doll body will be signed by me the artist.